OK, it’s time to revive the Love List Project. I’ve been getting nudges from multiple sources and directions, and I’ve decided to stop ignoring them. 1. I need to keep thinking about what I love, and I need to keep pursuing those things because it makes me more the person I’m meant to be. As I’ve drifted away from this practice, I’ve felt myself drifting away from who I am at my core. It’s not a good feeling. The busier I get, the more difficult it seems to remember who I am. Technically, I could make my love list a solitary pursuit, but I’m such an extrovert—I have a hard time continuing practices like this without the support and involvement of others. 3. I’ve been thinking and learning a lot about happiness lately, and I see love lists as a critical piece in that puzzle. Researchers believe a significant percent of our ability to be happy is within our control—in other words, not a matter of genetics or outside circumstances. When it comes to how exactly we can increase our happiness, there are many books and theories, like the gratitude theory. I’ve been trying to keep a gratitude list recently, and while I think it’s an important exercise, it seems like keeping a love list accomplishes many of the same results, with a twist. It feels more proactive, because it involves that second, action-oriented step: First paying attention to what feels most true in your life, and then organizing your life to make room for more of whatever that is. 1. On Facebook: Become a fan of Halfway to Normal here. At the beginning of each week, I will create a new love list post, most likely with a love list item of my own. Then everyone else can share items from their lists in the comments. I will do my best to collect those and share them periodically here. 2. 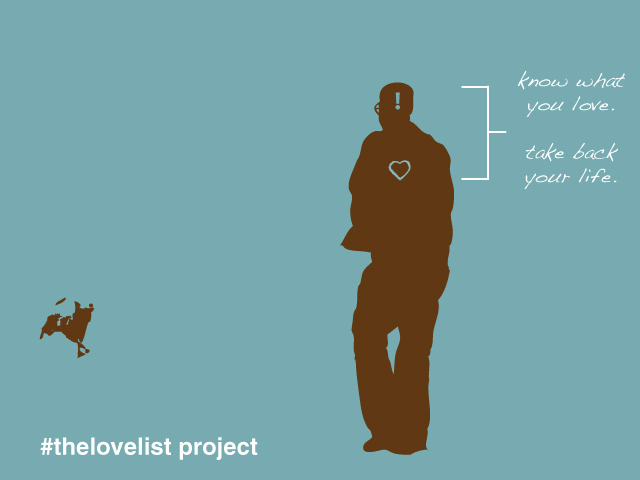 On Twitter: Share your love list items as tweets—don’t forget #thelovelist tag! The tag allows us to see all the tweets gathered together, and to be encouraged and inspired by them. (Even if you don’t have a Twitter account, you can stop by to see what’s going on with #thelovelist tag.) Again, I’ll do my best to collect those and share them periodically here. 3. On Halfway to Normal: My hope is that we’ll all be able to hear as many perspectives and stories as possible. I think it’s important because love lists are organic, and can take so many forms and go in so many directions. I also think it’s important for us to hear as many “success stories” as possible—for people to share the big and little ways making a love list has impacted our lives. Here’s my plan: I’m going to “interview” various people, basing my questions around the ones listed here. I might just send you an email and ask if you’re willing to be “interviewed,” but people should also feel free to volunteer themselves. :) Just send me an email using the “contact” button (see it up there, to the right, above my photo?). 4. In your own creative realm: If you have a blog, write a Love List Project post. I can even send you the graphics to use. If you express yourself through photography or art or hospitality, or any other number of ways, I’d love to figure out a way to share that, too, either here at Halfway to Normal or with a link to your own site. And if you have ideas, like Roxanne did when she started the love list group of Flickr, make them happen! I’m really looking forward to the Love List Project 2010, and your involvement in it! Hey Kristin, thx for the mention. Anyone can access the flickr group here. Please join in! I also started a blog, dedicated just to the love list project. If anyone out there is interested, i’m happy to invite them to the blog.This seems like the type of project that lends itself to collaborative effort. So … join the flickr group if photography is your thang, and/or join the blog (email me for an invite to the blog). Now I’ve got that song in my head ~ what the world needs now is love, sweet love …. enjoy your week! oops! forgot to leave the link to the love list project blog ~ here. I’m on it. Think about what I love everyday. Turns out, I love a lot! I’m glad to see the Love List Project resurface! It’s such a good opportunity to think about and appreciate the things that are important to us, and as you said, the things that make us who we are! Roxanne, thanks for sharing the Flickr group link! I meant to look it up and include it, but then I forgot. You’re absolutely right—this is the kind of project that works best as a collaborative effort. I love how you’re into that aspect. Robin, it’s good to hear that people like you are into this whole idea. I’m eager to hear how it impacts our day-to-day lives. Keep me posted! Glad you’re doing this again. I am, of course, in!